The New Jersey Nets have been streaky all year while the Boston Celtics have been the picture of consistency--consistent mediocrity. A note on interpretation: green upward whiskers are wins, red down whiskers are losses. So how can ordinary business folks make these things? Until now, sparklines have been the domain of programmers and graphic artists. Thankfully, Bissantz, a German company, had an elegant idea. 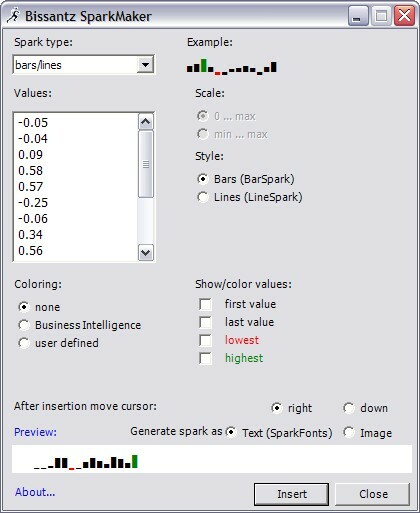 The created a set of special sparkline fonts and an easy to use tool that you can use to build sparklines in Excel using their fonts. The tool looks like this. It works in Excel and it really is fun and easy. If you want to learn more about sparklines and see some beautiful examples; the canonical page for sparkline theory and discussion is here. Edward Tufte provides a chapter on sparklines from his newest book followed by a back an forth discussion with practitioners in the field. Lots of great examples!